We provide ongoing programs for educators, school teams, and districts to enhance teaching and learning and support the advancement of STEM education goals. We are a Massachusetts Department of Elementary and Secondary Education-approved professional development provider and award PDP certificates for programs of ten or more hours in length. Our teacher educators work in the Educator Resource Center leveraging the rich resources of the Museum and its library collection to support the needs of teachers as professionals and adult learners. 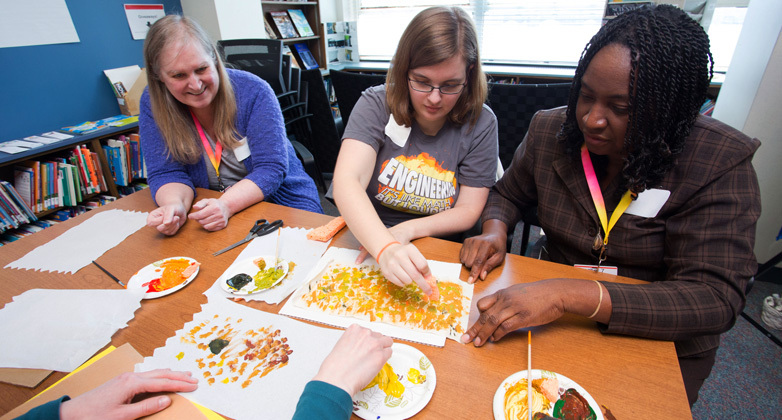 Engage in science and engineering practices while exploring new content, teaching ideas, and Museum resources in our educator workshops. Most workshops are offered free of charge to Teacher Partners. Keep up to date with our latest offerings and events for educators by joining our free Teacher Partner program! 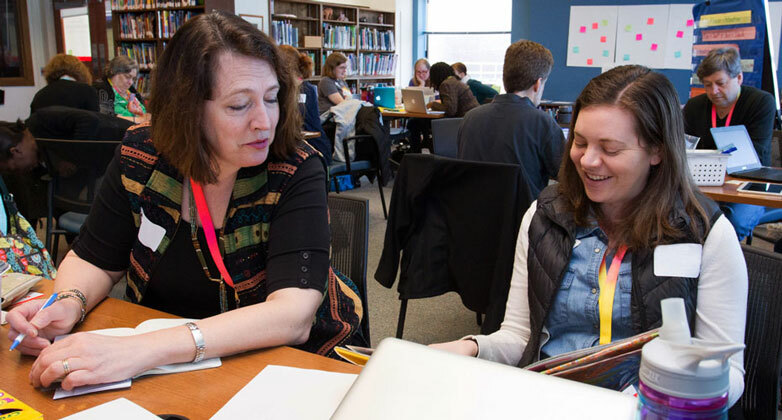 Groups of two to twenty-four educators are invited to schedule professional development retreats of up to a full day in our Educator Resource Center. The ERC is a comfortable, well-equipped space with access to our print and media resources, wireless Internet and photocopying resources. Groups can also take advantage of the Museum’s exhibits, educational programs, and talented staff in order to support their learning goals. These programs are offered at no cost to teachers. Parking is free for participants. In order to deliver effective professional learning experiences for schoolteachers, we design these programs with the teachers’ needs in mind. We work closely with school leaders to better understand the current initiatives in science, technology, engineering, and mathematics (STEM) within their schools and districts. Together we identify ways in which a program at the Museum of Science can support teachers who are engaging with these efforts. Participants make the ERC their home base for the day, but when appropriate for your group, our staff can facilitate opportunities that leverage the Museum’s unique learning environment. We position teachers to assume the role of scientists and engineers, by having them make sense of new phenomena, or find new solutions to real-world problems. By having the participants enact the skill sets of STEM professionals, the teachers gain new insights into science content, as well as a deeper understanding of the science and engineering practices. I wanted to say a quick "thank you" to the Museum of Science for such an inspiring day. This was just the motivation the teachers needed to move forward with this work. The wealth of available materials, inspiration time in the museum itself, flexibility in meeting the varied needs of our group, and your outstanding knowledge and expertise made this day amazing. When I think back to how much we were able to do, I can't believe it! We still have a lot of work ahead of us, but the teachers left feeling much more comfortable with the content and supported by the district. I call that a success! To discuss goals or schedule contact Lesley Kennedy: lkennedy@mos.org / 617-589-0348. Would you like to focus your next field trip to make it a valuable learning experience for your students? Museum educators can help you integrate your objectives and make connections to your educational standards in science, technology, and engineering. Make an appointment and bring a colleague or a PTO member! Support can also take place via phone and/or email conversations. Please schedule appointments at least one week in advance. University professors are encouraged to bring their pre-service education classes to the Museum for an introduction to learning in informal education settings. Our staff provide an overview of the Educator Resource Center services and programs, emphasizing support for teachers as learners. Following a mini-lesson on inquiry science or engineering design, students have time to interact with our print and media resources. They also visit our Exhibit Halls in support of a discussion on planning effective field trips. Course professors are involved in program planning and co-facilitate to ensure that the lessons support overall course goals. The Museum offers curriculum tools and professional development opportunities for integrating engineering education into K – 12 classrooms. EiE provides comprehensive professional development for teachers, schools, and districts — at our location or yours. Flexible, learner-centered workshops prepare you to implement our award-winning curriculum — or teach other educators about EiE. You’ll gain a deeper understanding of engineering concepts, skills, and pedagogy and leave prepared to teach engineering with confidence and foster student-centered, inquiry-based learning. Engineering the Future: Science, Technology, and the Design Process™ is a full-year course designed to introduce high school students to the world of technology and engineering. In partnership with It’s About Time®, we provide a variety of dynamic, hands-on sessions to teachers who are making this course part of their curriculum. Get an overview with our half-day informational session, or delve deeper with a three-day institute or topic-focused session. An online course is also available. Endorsed by the Massachusetts STEM Advisory Council as an @Scale educational model and replicated across the US, this project helps school districts develop strategic plans to implement K –12 technology and engineering programs, while introducing educators to resources supporting standards-based curricula and assessments.